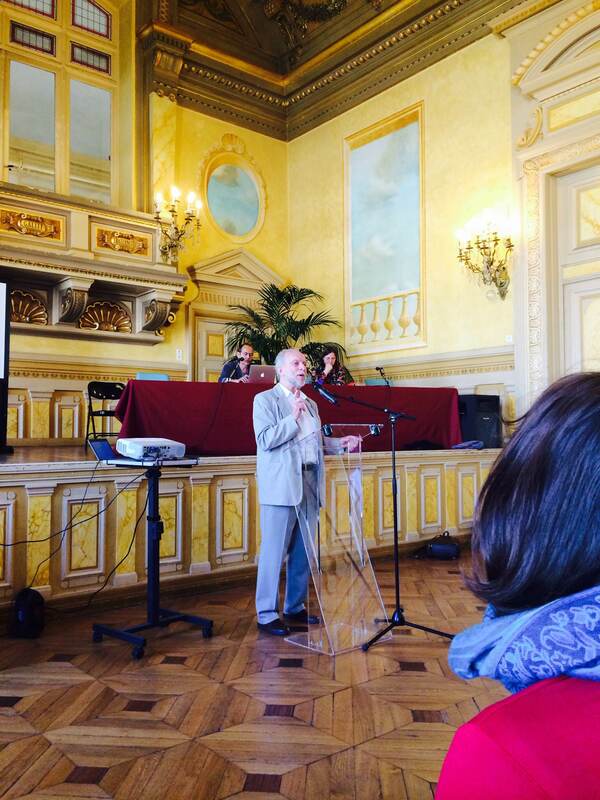 In the famous Town Hall of Paris’ 19th Arrondissement, Jacques Brodeur, ACME Board member, founder of EDUPAX (Quebec), and “Showman Extraordinaire,” in the words of his French colleagues, called to order the first European colloquium on the reduction of screen time, Les Enfants Face aux Ecrans: le Point (Children Before Screens: An Update). The symposium was held in the opulent Salle des Fêtes, whose gilded decor offered a soupçon of luxury to the proceedings. More than 200 educators, psychologists, parents, students, librarians, and health care professionals gathered for this unprecedented one-day symposium designed to educate, motivate, and empower schools and families to support the Screen-Free Challenge organized five years ago in France. At the heart of the organizing and hosting committee were the principal, teachers, and parents of 40bis Manin Elementary School, where students have participated in this screen-free week every year since 2009. With apparent difficulty, six of the students mentioned long-forgotten alternatives (drawing, sports with friends, spending time with their families) while one spunky young Frenchman said, “The first thing I’d do is figure out who took my screens!” There was a burst of laughter from the audience, but Brodeur had made his point. 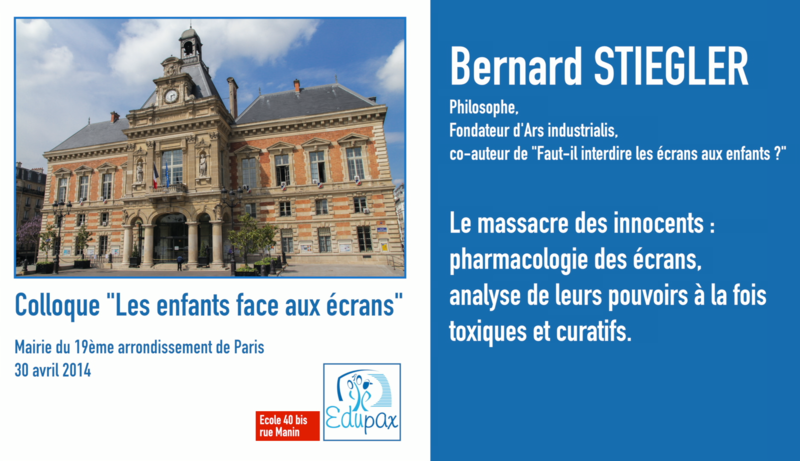 The students were followed by college professor Loys Bonod and adolescent psychiatrist Bruno Harlé, who echoed Bernard Stiegler’s assertion that the culture of “Distraction or Death” (Se Distraire ou Mourir) robs children of cognition and creativity and limits their emotional and intellectual development. After this fundamental challenge was identified, the audience heard from mothers, educators, and various professionals who spoke about their defensive strategies, education, and organizing efforts to limit screen time, which culminated in the hugely successful screen-free week for the last five years. In France, well over 180 schools and colleges have participated in the Screen-Free Challenge. Following these varied and provocative testimonials, American educator Kristine Paulsen, from Escabana, Michigan, wrapped up this section of the day by explaining her version of the SMART program (Student Media Awareness to Reduce Television, coined by Dr. Thomas Robinson of Stanford University), “Take the Challenge/Take Charge.” Her insights underscored the benefits of implementing a community-wide media-education program. It was at this point, coincidentally, that the mayor returned unexpectedly to the Salle des Fêtes to announce his plans to extend this screen-free week to all the schools in his community—to the benefit of thousands of students. By then Bernard Stiegler had been called to philosophize elsewhere, but it was clear that his battalions had been mobilized. ← Screen-Time Reduction Goes International!